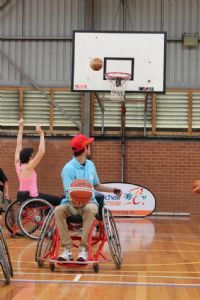 Council’s Access Advisory Committee hosted an afternoon of wheelchair basketball recently in Bermagui to raise awareness of wheelchair accessibility in the Shire. With the help from Wheelchair Sports Australia, the Access Advisory Committee hoped to raise the profile of access issues in the Shire for people who use wheelchairs. Committee Chair Ron Finneran said the goal was reached as community members stepped outside their comfort zones and enjoyed a fast and exciting game of wheelchair basketball. “We wanted to raise awareness of what it’s like to use a wheelchair in the Shire, and wheelchair basketball was a great way to demonstrate mobility and access issues while getting some exercise and enjoying yourself. “Retirees and families with young children also have a need to get around the Shire a lot easier than they currently do, so it’s important to view accessibility as a concern for most of the community.” he said. Event organiser, Sue Thomas was encouraged to see the community getting involved by having some fun while also focussing on the challenges of living with a disability. “We wanted to get people to experience being in a wheelchair and what that is like. "The aim of giving people the experience of being in a wheelchair and having some fun playing wheelchair basketball, may also help people understand issues that may come along with being in a wheelchair such as access issues,” she said. Council Committee delegate Cr Sharon Tapscott joined in the action, “it was energetic and exhausting! You’ve got to be mentally and physically agile. You have to be an athlete! “People within the community – particular those that build or develop – had a valuable opportunity to find out what it is like to manoeuvre themselves around areas that are difficult for accessibility,” she said.